New Years seems a long time ago now, but given that I haven’t posted anything since the holidays, I thought it worth mentioning. I had a fantastic start to 2014 up in the Lake District, battling downpours but nonetheless finding a break or two between the clouds for brisk walks amongst the valleys and dales. It is a brilliant place for a party, great for hunkering down, games, the aforementioned walks and, above all, eating. There were about 25 of us and I was put in charge of pud on the big night itself (no pressure). I went for a classic pear and frangipane tart, with plenty of boozy cream to go with, of course. 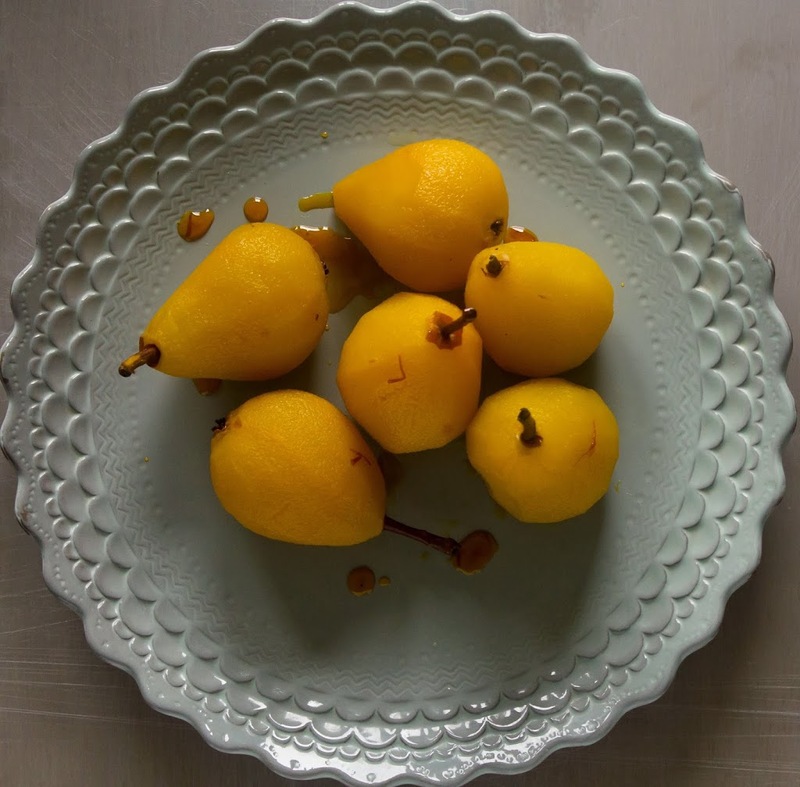 So I’ve been thinking a lot about pears and tarts recently as well as sweet spices, like cardamom, ginger and saffron. 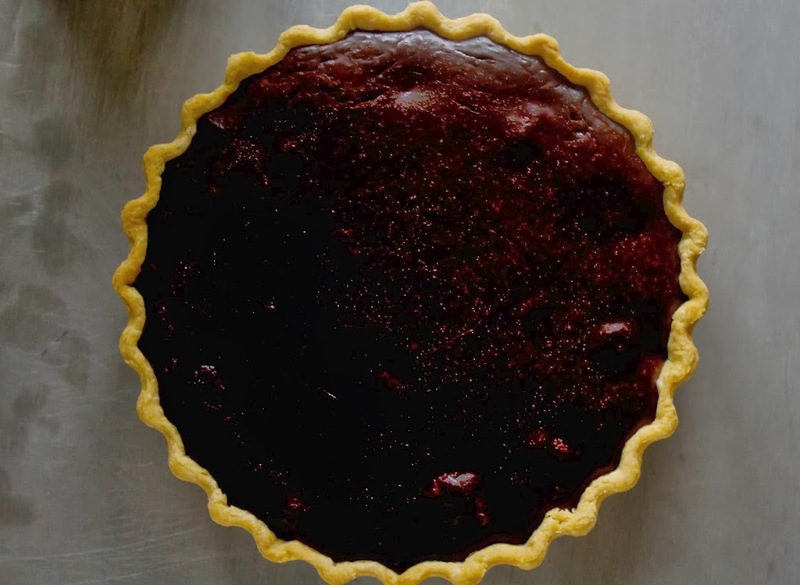 The tart recipe in this post was a bit of an experiment, but one that payed dividends. A decadent dinner party pudding with ginger pastry, saffron poached pears and rich, bitter chocolate ganache. I implore you to give it a go. In other news, I was recently given a selection of syrups from Iceland. These include birch-tree syrup, rhubarb syrup and a berry syrup. It is very difficult to find anything out about these syrups online, mostly because all my search efforts seem to lead to the budget frozen supermarket chain, Iceland, and its online listing for Lyle’s golden syrup. I’ll keep researching, but what I can tell you is that these little pots are a total joy. I was particularly excited to try the birch syrup as I recently went to Scandinavian food event where I had birch sap sparkling wine by Sav, which was, incidentally, absolutely delicious. With my birch sap syrup pot, I made a pear and birch spread for toast and cakes. Fruit butters are really no more than purees and sound much fancier than they are. But I do love the idea of making these as preserves and having a jar around just for when you fancy it. This would make a great cake filling as well. 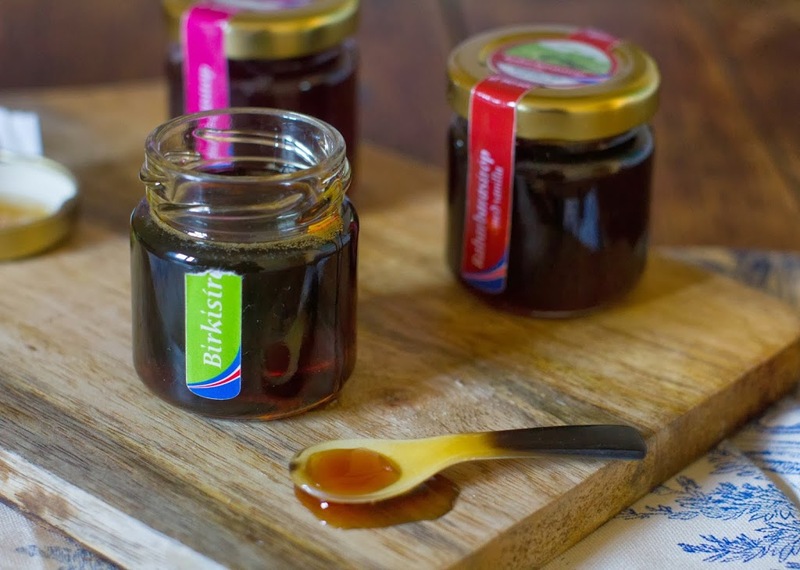 Of course, if you can’t get hold of birch sap you can simply use a high quality maple syrup. 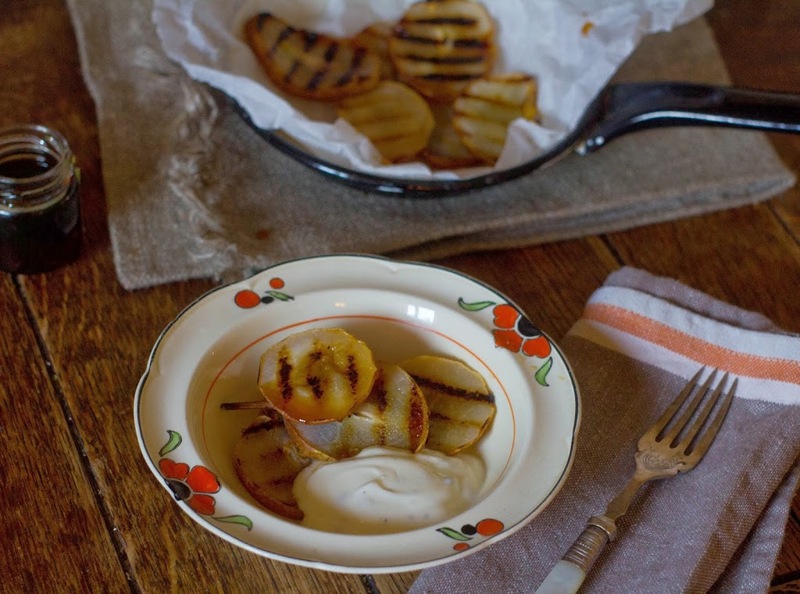 I also grilled some pears, brushed them with birch tree syrup and then simply served alongside a simple cardamom yoghurt. 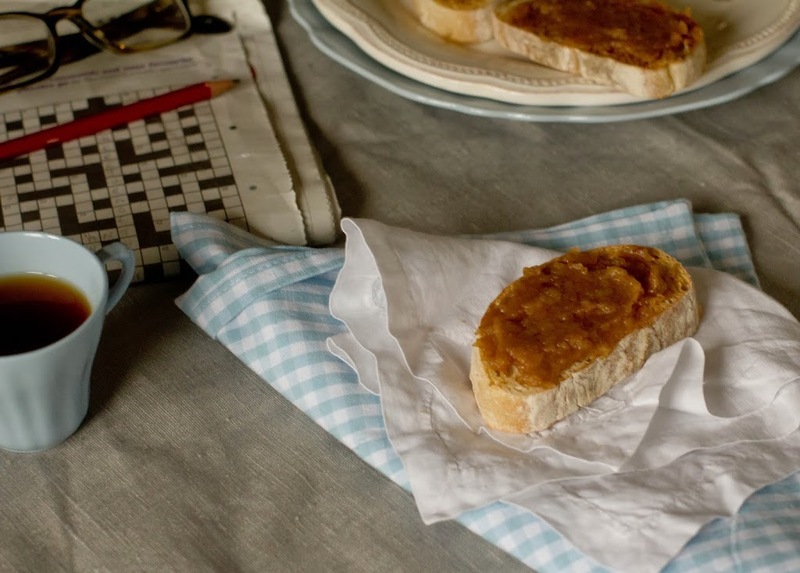 This actually makes a delicious, slightly unusual breakfast and is just the thing to ward against these wet days. 1. Preheat your oven to 200C. Roughly chop pears and place on a baking tray. In a small bowl, mix together the syrup, salt, coconut oil and ground cinnamon. 2. Toss through the pears and bake for about 30 min until golden and beginning to caramelise. Cool thoroughly then blitz in a mixer or using a hand blender. Spread over toast, muffins or stirred into your muesli for breakfast. Will keep for 1 week in the fridge. This is a rich, decadent dessert. 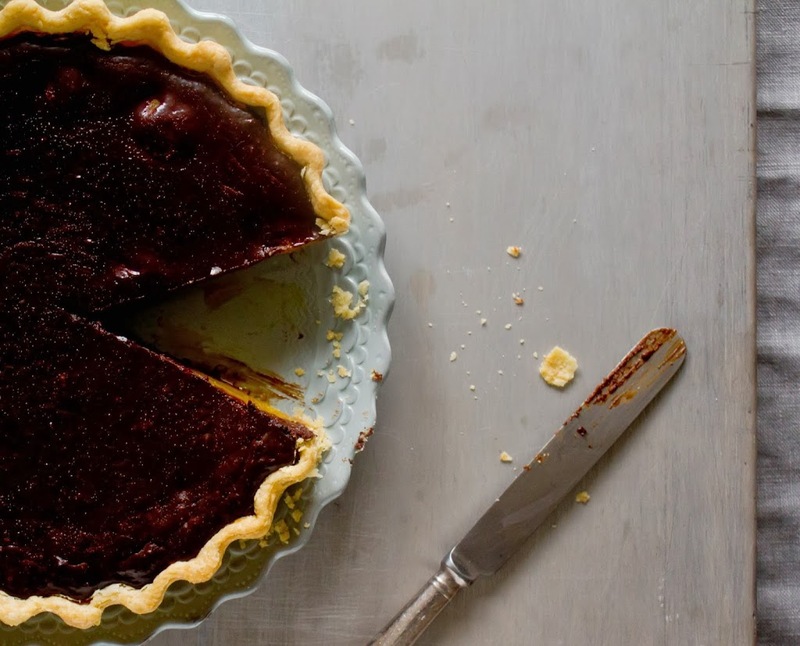 Perfect to impress as it combines pastry making skills, pear-poaching and chocolate work (ganache). 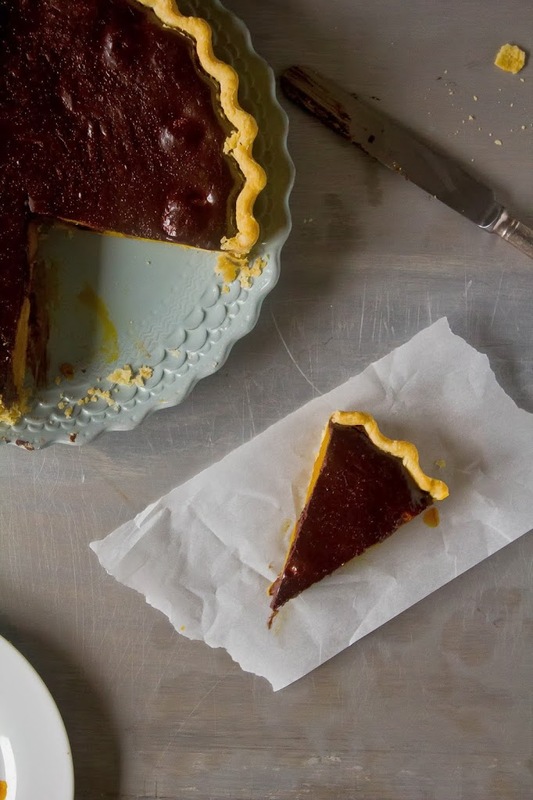 However, it really is easy as pie to make and looks beautiful once you cut into it. Definitely one for the grown ups, though, as the chocolate is bitter and the saffron aromatic. 1. 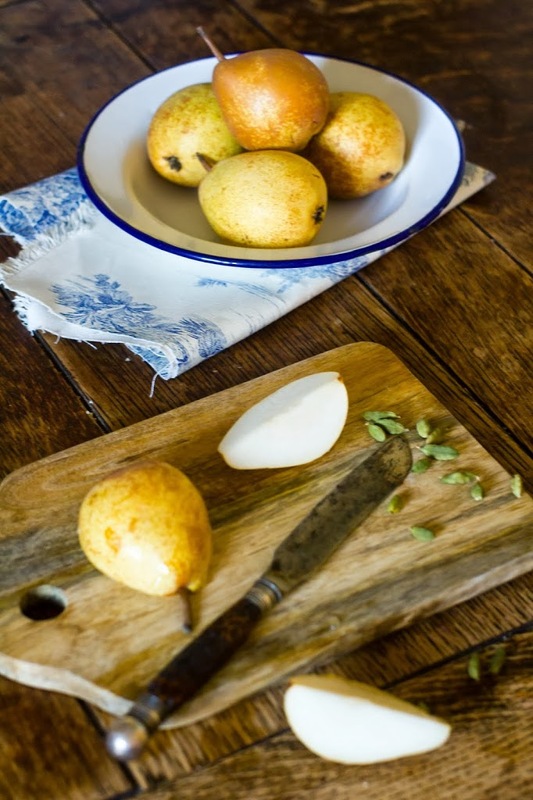 To poach the pears, heat the pear liqueur and water in a large saucepan. Add the sugar, saffron, ginger and lemon peel and stir until the sugar has dissolved. Add the pears and bring to a gentle simmer. Top with the round of greaseproof paper and weight down with a saucer. Cover and allow the pears to poach until just tender, about 30 minutes. Lift out and allow to cool before halving and scooping out the core with a teaspoon. 2. Meanwhile, make the pastry. Sift together the flour, salt, sugar and ginger. Work in the cubes of butter until you have a breadcrumb-like consistency. You can either do this by hand or in a mixer. Combine the egg yolks with 2 tbsp of water and add about half of it to the flour mixture. Work to a dough, adding more liquid if necessary. Wrap into cling and flatten into a disc then chill for 30 min. Roll out, line and blind bake the pastry case for about 20 min in a 200C oven. 3. Place the chocolate in a small bowl. Bring the cream to a boil and then pour over the chocolate. Leave to stand for a few minutes, then stir to combine. Add a few tsp of the saffron syrup to taste along with some additional pear liqueur, if desired. Finally, stir in the eggs. 4. Preheat the oven to 180C. Arrange the pears in pastry case then pour over chocolate ganache. Bake 25-30 mins, until just set with a tiny bit of wobble.